Making a patchwork pillow cover is not only a relatively quick (and satisfying) project but also an opportunity to try out or expand on a recently learned skills: this time another version of the slice and dice technique. Albeit a very restrained and structured slicing and dicing with the rotary cutter. It was also the perfect opportunity to use this stashed canvas text fabric (from the Authentic range by Sweetwater for Moda) for the back of the pillow cover! 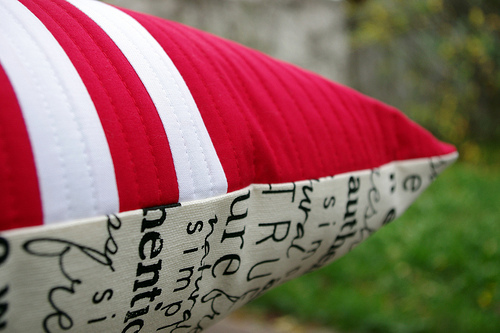 The pillow cover has a zippered seam for easy insert removal and cleaning. Thankfully this zipper business is finally becoming less daunting. I have listed this pillow cover in my Etsy Store. 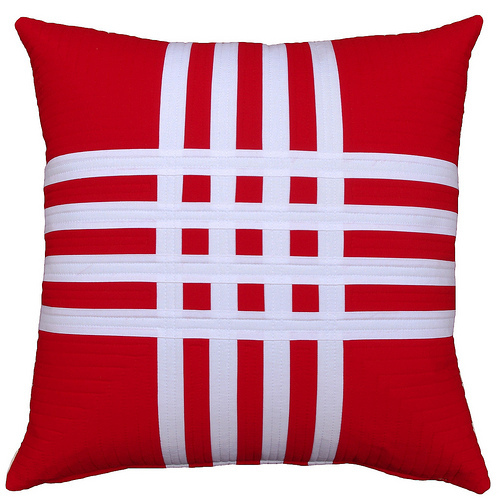 You can see the listing here: Modern Patchwork Pillow Cover. Pattern: Improvised ~ I started with a red/white strip set (half the width of the fabric) which I sliced and pieced back together again by inserting a strip of white fabric - the trickiest part is ensuring continuity of the stripes. Careful piecing and pressing, and the use of the seam ripper was required. 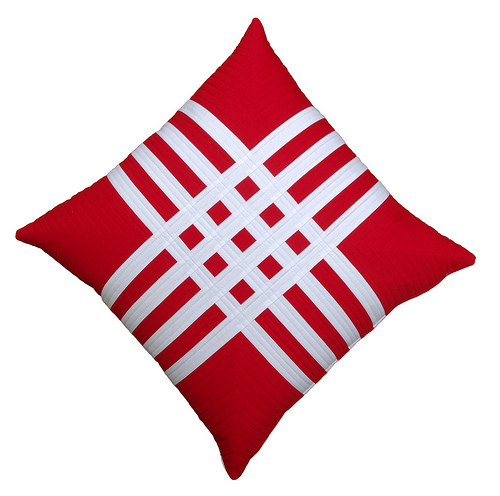 Quilted: A varied grid of lines - some intersecting - with either red or white cotton top thread to match the fabric. Way too much fun! 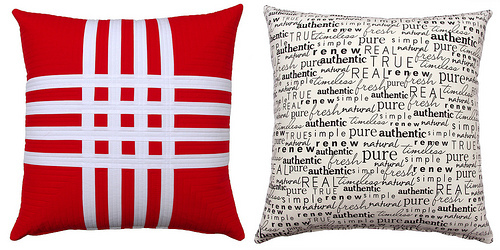 Don't be surprised if you see more of these pillows here. Love this pillow! Any chance youd write a pattern for it! Thank you for sharing. 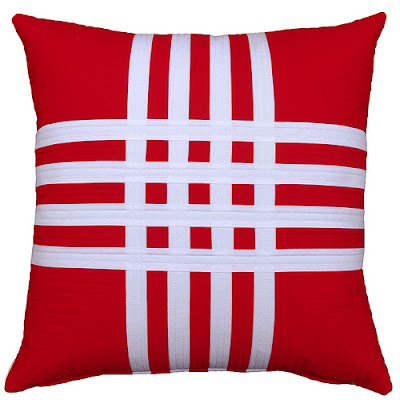 This cushion just shouts out happiness witht he bright colours. I also love your backing fabric, text fabric is always fun. The backing fabric is sort of a sweet surprise when you turn over the pillow. Great job. Love it and I'm not even a fan of red! What brand of thread do you usually use for your top stiching? I love the detail of the top stich on the corners of the pillow you can barely see it the photos, but looks amazing and very detailed! Love it! This is a great pillow! Rita, Your pillow looks like a piece of Art! I really, really, like it. wow, this is so great!! i am sooo gonna steal that block idea.. :-) thanks for sharing! I love that pillow! It's so so cute! The colors are fabulous and that idea is seriously pin-worthy!